Cat Shows US!! CFA Inc. Advertise on Cat Shows US!! Cat Shows US!! 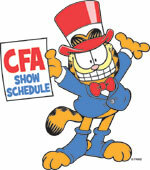 the most up-to-date site for information on cat shows. This web site is the property of The Cat Fanciers' Association, Inc.